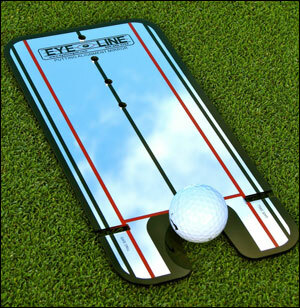 The Putting Mirror is an optimal alignment training aid used by many tour players and trains to improve your putting. It immediately improves your "alignment to target" and "putter-face alignment" while keeping your eyes over (or slightly inside) of the line you're putting. This promotes a better stance and stroke. The Putting Mirror gives visual feedback where your eyes, putter face, and shoulders are in relation to the shot, improving accuracy and consistency, and creating confidence on the green! Improves your alignment to target. Improves your putter face alignment. Promotes an ideal putting stroke. Trains eye line, club face, and shoulder alignment. Alignment lines guide the proper club path. Putter gate drill assures sweet-spot contact. 12-inch - easy to carry - great for indoor or outdoor use.